Waterloo – New paramedics seeking employment and paramedics returning to work after extended absences will now be able to take an evidence-based physical abilities test developed by a team of researchers in close consultation with working paramedics. Renée MacPhee, an associate professor in Wilfrid Laurier University’s departments of Kinesiology and Physical Education and Health Sciences, and two other kinesiology experts, Steven Fischer of the University of Waterloo and Kathryn Sinden of Lakehead University, led the development of the trademarked Ottawa Paramedic Physical Abilities Test (OPPAT). The group hopes the test will be used across Ontario, creating a consistent method for assessing paramedic fitness. The test will be officially launched at a drop-in open house on Thursday, Feb. 15, from 1:30-4 p.m., at its testing centre at 230 Regina St. on Laurier’s Waterloo campus. 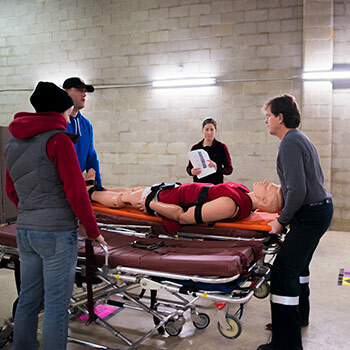 Unlike many existing tests, OPPAT closely simulates what paramedics do in real life. It consists of circuits where paramedics move through a series of progressively more physically demanding tasks such as loading and unloading a stretcher, moving a stair chair using a patient-carry transfer device, and performing cardio-pulmonary resuscitation (CPR). OPPAT meets the bona fide occupational requirements of the paramedic profession and conforms to weight standards established by the Ministry of Health and Long-Term Care. MacPhee and her colleagues began to develop the test in 2014, after a union in Ottawa successfully grieved the use of a test it argued was unrealistic and resulted in injury to some paramedics seeking to return to work. The arbitrator in the case made the decision to have experts develop a new test. The university researchers worked with five paramedics from the Ottawa Paramedic Service – Paolo Bottiglia, Monica Di Iorio, Michelle Farragher, Amanda MacIvor and Sylvie Rochon – who were recruited as research assistants. The five actively participated in designing, pilot testing and gathering feedback. “They were able to say to us, ‘That’s not how we would do this. We would do it this way.’ And we would adjust the test accordingly,” said MacPhee. A registered kinesiologist will both walk candidates through the test and evaluate them. A registered nurse will be responsible for ensuring the health and safety of the candidate during testing. An active duty frontline paramedic will be the candidate’s lifting partner – another point that differentiates OPPAT from many existing tests. Paramedic and emergency medical services across Ontario are invited to include the OPPAT in their new hire and return-to-work processes. In addition to the Waterloo testing centre, there is an Ottawa testing centre located at the Ottawa Paramedic Service headquarters at 2465 Don Reid Drive. An official opening for that centre is being planned for March. The researchers are also working on plans to open a third site in Northern Ontario. Day, evening and weekend testing times are available to meet the needs of student candidates. For more information, see www.oppat.ca.